AutoPass is an option to help pay any auto repair expense that comes your way whether that be expected preventative maintenance or untimely unexpected repairs. 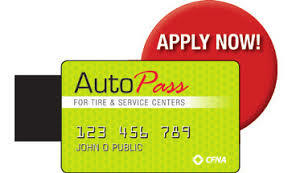 AutoPass offers interest free credit loan for 6 months﻿. Click on the icon to the left to apply. You will be asked to fill out a 10 to 15 question application. It takes only a couple of minutes to do so. An email will be sent to you asking to confirm the application, after you do so you will get an answer within 90 seconds via email with the amount that you are approved for. Included will be your AutoPass account number that you can immediately use. The card will be mailed to you. You will have six months to pay back the charges interest FREE! For further details call us and we can answer any question you may have.